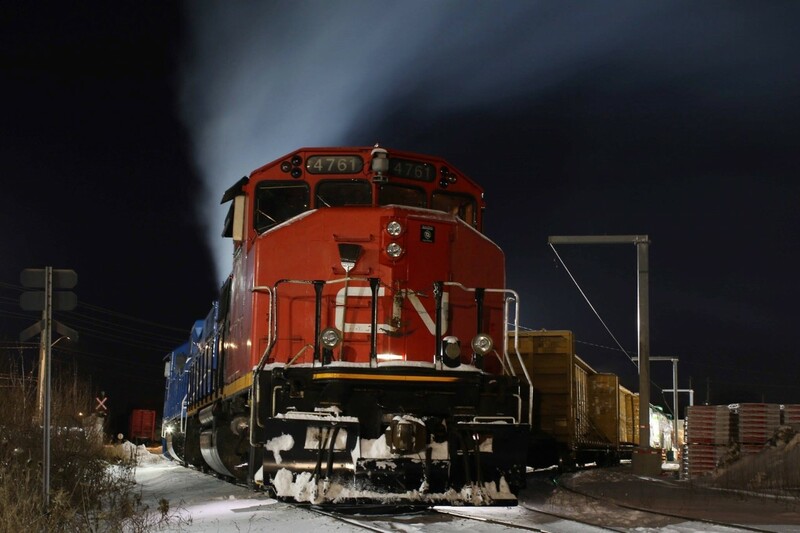 Railpictures.ca - Marcus W Stevens Photo: The smell of diesel exhaust hangs heavy in the air at Preston as GMTX 2274 idles away trying to maintain its internal temperature on a bitterly cold night. With a wind chill of almost -30 it’s prime mover won’t get much of a break before the mornings call to duty. In the background a worker is busy unloading the last two cars of wallboard before the local lifts the cars in the morning and takes them to Guelph with the cut of cars on the main in the distance. | Railpictures.ca – Canadian Railway Photography – photographie ferroviaire Canadienne. Caption: The smell of diesel exhaust hangs heavy in the air at Preston as GMTX 2274 idles away trying to maintain its internal temperature on a bitterly cold night. With a wind chill of almost -30 it’s prime mover won’t get much of a break before the mornings call to duty. In the background a worker is busy unloading the last two cars of wallboard before the local lifts the cars in the morning and takes them to Guelph with the cut of cars on the main in the distance. Nice night shot Marcus. CN 4761 still has decent paint on it, compared with the other two GP38-2(W)’s that were assigned recently to the Guelph Subdivision operations.